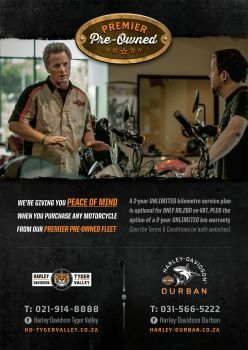 We're giving YOU peace of mind when you purchase any motorcycle from our Premier Pre-Owned Fleet! A 2 year unlimited kilometer service plan is optional for ONLY R8,260 ex-vat PLUS the option of a 2 year unlimited kilometer warranty! · This warranty is a comprehensive Mechanical Breakdown Warranty that covers the repair or replacement of components due to a mechanical breakdown that occurs during the period of this policy. · Eligible vehicles are new and used motorcycles following the expiry of the manufacturer’s warranty up to the 10 years of age, with mileage lower than 80 000kms and excludes motorcycles modified from the manufacturers specifications. · Insured motorcycles need to be serviced and maintained according to manufacturer’s specifications. This is a service plan and not a "maintenance plan/ motor plan", therefore wear and tear items such as brake pads, clutches, tyres, air filters and items not related to a normal service are not covered.